Aim: The study aims to evaluate and compare marginal microleakage in deep class II cavities restored with various techniques using different composites. Materials and Methods: Sixty freshly extracted teeth were divided into six groups of 10 teeth each. Standardized class II cavities were made and were restored using composites of different consistencies with different placement techniques. Group 1 with Microhybrid composite, Group 2 with Packable composite, Group 3 Microhybrid composite with a flowable composite liner, Group 4 Packable composite with a flowable composite liner, Group 5 Microhybrid composite with precured composite insert in second increment and Group 6 Packable composite with precured insert in second increment. Specimens then were stored in distilled water, thermocycled and immersed in 50% silver nitrate solution. These specimens were sectioned and evaluated for microleakage at the occlusal and cervical walls separately using stereomicroscope. Results: The results demonstrated that in the occlusal wall, packable composite, showed significantly more marginal microleakage than the other groups. In the cervical wall, teeth restored with a flowable composite liner showed less marginal microleakage when compared to all other groups. Conclusion: Based on the results of this study, the use of flowable composite as the first increment is recommended in deep class II cavities. Many techniques have been tried to reduce this microleakage. Oblique layering technique with increments (1 to 1.5 mm in depth) of wedge- or triangle-shaped produce lowest C factor and minimizes stress formation. When used as lining materials beneath composite restorations, flowable composites may improve marginal adaptation. A recent method designed to reduce shrinkage stress consists of reducing the initial conversion by using different curing modes. An exponential increase of intensity over a given period in ramped or soft start curing technique provides the least shrinkage stress and potentially the optimized polymerized state. The use of beta-quartz glass ceramic inserts  and pre-polymerized composite inserts  in the mass of restorative material are other methods proposed to minimize polymerization shrinkage of light-cure composites. However, there is lack of abundant literature on comparative use of flowable liner or a pre-cured composite insert in decreasing the microleakage of composite resin restorations. So, this study is designed to compare the effect of flowable liner and precured composite insert in reducing marginal microleakage of two different composites (Microhybrid and Packable) in Class II cavities, where oblique layering technique and ramp curing mode are used during restoration. Sixty human third molars free of caries and restorations were collected and stored in normal saline. One hundred and twenty standardized class II cavities were prepared on the mesial and distal surfaces of each tooth. Each cavity was prepared with a carbide bur (# 245, SS White). For every five preparations, a new bur was used. The final preparation showed the following dimensions: 2.0 mm occlusal extension, 3.0 mm buccal-lingual extension. The gingival seat was placed at the CEJ [Figure 1] and [Figure 2]. Each specimen was mounted with the adjacent teeth for placement of Tofflemire matrix which allowed building up of the proximal wall. All cavity surfaces were dried with oil free compressed air followed by etching with 35% phosphoric acid for 15 seconds, rinsed with water for 15 seconds and excess water was removed with the help of a tissue paper, leaving a glistening hydrated surface. The primer (Scotch Bond Multipurpose, 3M Espe) was applied to etched enamel and dentin and gently dried for 5 seconds. Then, the Scotch Bond Multipurpose adhesive was applied to primed enamel and dentin and light cured for 10 seconds. The specimens were randomly divided into six groups. In all the groups, each increment was cured for 40 seconds using the ramp curing mode (initial intensity of 200 mW/cm 2 and increasing over 600 mW/cm 2 in 40 seconds). The thickness of the first increment was 0.5 mm and this increment was cured for an additional 20 seconds using conventional curing mode. The thickness of each increment placed was confirmed with the help of a graduated probe by measuring the depth of the walls prior to and after the placement of the composite. The rest of the cavity was filled with the help of oblique layering technique, i.e. using triangular or wedge shaped increments of 1.5 mm thickness, which contacted only one opposing wall at a time. The second and third increments were cured for an additional 10 seconds. The curing was done from the occlusal aspect with the tip of the curing unit placed as close to the occlusal surface as possible. Group (G1) was restored with the microhybrid resin composite Z 100 (3M, Espe) using oblique layering technique. Group 2 (G2) was restored with the Packable/compactable resin composite Filtek P60 (3M Espe), using oblique layering technique. Group 3 (G3) was restored with a first increment of a flowable resin composite, Filtek Flow (3M Espe), placed on the cervical wall of the cavity in a thickness of 0.5 mm and light cured for an additional 20 seconds using the conventional curing mode. The rest of the cavity was then restored with microhybrid resin composite (Z100, 3M) using the oblique layering technique. Group 4 (G4) was restored with the first increment of a flowable resin as described in group 3. The rest of the cavity was restored with packable resin composite (Filtek P60) using the oblique layering technique. Group 5 (G5) and Group 6 (G6) were restored in the similar way as groups 1 and 2 but with a pre-cured composite insert in the second increment. The pre-cured composite insert was prepared using a Teflon mold of 1mm diameter and 1mm depth. Resin composite was placed into the mold using a smooth surface condenser. The excess composite was removed using a scalpel blade and the surfaces of the resin composite inserts were immediately covered with a transparent cellulose strip and cured for 40 seconds. Then the insert was removed from the mold. Following the restorative procedures, the metallic individual matrix was removed and the occlusal surface finished and polished. The teeth were now mounted in a 0.75 inch diameter polyvinyl chloride (PVC) ring filled with auto-polymerized acrylic resin, to allow root sealing. The specimens were then kept in distilled water at 370° C for 24 hours. In order to evaluate the marginal microleakage, the teeth surfaces were isolated with nail varnish, except for 2.0 mm around the restoration to allow contact with the tracing agent. The specimens were thermocycled at 5 ± 10° C and 55 ± 10° C for 1,000 cycles and immersed in 50% silver nitrate solution for 2 hours. Following removal of nail varnish, the specimens were sectioned using microtome at the center of the restoration mesiodistally. Each of the sectioned surfaces was regularized with Super Snap polishing discs. The sectioned specimens were observed with a steromicroscope (X30 magnification) and scored for the degree of dye penetration at the occlusal and cervical walls. These are illustrated in [Figure 3] and [Figure 4]. The aim of the present study was to evaluate marginal microleakage in class II composite restorations at the occlusal and cervical margins. Multiple group comparison was done using ANOVA. Mann Whitney test and Chi-square test were used to calculate P value among different test groups. If P < 0.05, it indicates significant difference. If P < 0.001, it indicates highly significant difference among different groups. In the occlusal margin, except for groups 2 and 6, the restorations in the other groups were relatively free of marginal microleakage. Groups 3 and 4 showed no microleakage in the occlusal wall. Group1 showed dye penetration into enamel in one cavity and beyond dentino-enamel junction in one cavity. Group 5 showed dye penetration into enamel in 2 cavities. The microleakage on the occlusal wall is not significant statistically between Groups 1, 3, 4 and 5 when analyzed with ANOVA. [Table 1] shows the dye penetration score as an indicator of microleakage in the occlusal wall. 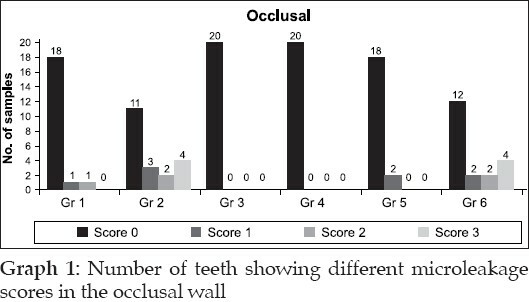 Results for occlusal wall showed significantly better score for groups 3 and 4, when compared to other groups. The order of microleakage is as follows: 3 = 4 < 5 < 1 < 6 < 2. The same results were depicted in Graph 1. [Table 2] shows the dye penetration score as an indicator of microleakage in the cervical wall. 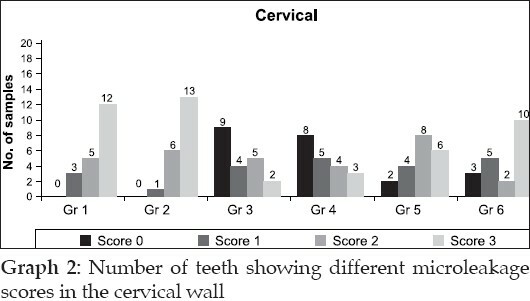 Results for cervical wall showed highly significant difference in the groups 3 and 4, when compared to groups 1 and 2. Significant difference was seen in groups 5 and 6, when compared to 1 and 2. The order of microleakage in the cervical wall is as follows 3 < 4 < 5 < 6 < 1 < 2. The same results are depicted in Graph 2. In recent years, resin composites have become more useful as posterior restorative materials. Polymerization shrinkage is one of the primary deficiencies that complicated the use of this versatile class of restorative material and possibly limits service life expectations. Polymerization shrinkage of dental resin composites is because monomer molecules are converted into a polymer network and, therefore, exchange van der Waals spaces into covalent bond spaces. This polymerization shrinkage creates contraction stresses in the resin composite restoration leading to microleakage and internal stress in the surrounding tooth structure. , Reduction of the polymerization shrinkage has been an important issue with the use of dental resin composites. Thus, in spite of much advancement seen in the composite restoratives and bonding agents, reliable adhesion without marginal gap formation has proven elusive. Restoring class II cavities with resin composites has always been a point of debate, especially in deep cavities where there is no enamel and the cavity margins are formed of dentin, cementum or both. Bonding to dentin is more difficult to achieve due to the specific properties of dentin such as tubular structure and intrinsic wetness. To minimize stress from polymerization shrinkage, efforts have been directed towards improving placement techniques, composite formulations, and curing methods. So, the present study is designed to compare the effect of flowable composite liner and precured composite insert in reducing marginal microleakage of two different composites (Microhybrid and Packable) in class II cavities, where oblique layering technique and ramp curing mode were used. The reliable enamel bond with the restoration in group 1 (Microhybrid composite)  and the presence of precured composite insert which decreased the amount of uncured composite within the cavity (around the inserts)  in group 5 (Microhybrid composite + precured composite insert) reduced the overall polymerization shrinkage and the stress associated in groups 1 and 5. This good seal with enamel margins is because of the enamel etching technique in controlling microleakage. Also the thin and medium consistency composites (Flowable composite liner in groups 3 and 4) have better adaptability when compared to packable composites whatever the application mode used. In the cervical wall, the order of microleakage is as follows: 3 < 4 < 5 < 6 < 1 < 2. Group 1 and group 2 showed the maximum microleakage in most of the cavities. This was due to the unreliable bond produced by both the restorative materials (Microhybrid and Packable) with the dentin and/or cementum. Additionally the shrinkage of resin during polymerization can overcome the bond to dentin and produce micro gaps. When these two groups are compared, group 1 showed less microleakage than group 2. This is because Microhybrid composite has better adaptability than Packable composite due its less viscosity and hence better flow. One of the most influential factors for microleakage is the alternating contraction and expansion of the restorative material when subjected to changes in temperature. Since it has less filler content, the coefficient of thermal expansion of flowable composite is close to that of the tooth structure , and this further increased the marginal adaptation when the specimens were thermocycled. Within the limitations of this study, it can be concluded that the use of a flowable composite liner with microhybrid or packable composites is highly recommended in restoring deep class II cavities to reduce the marginal microleakage and the problems associated with it. Precured composite insert, to some extent also prevents the microleakage. 3. Leinfelder KF. Using composite resin as a posterior restorative material. J Am Dent Assoc 1991;122:65-7. 4. Bayne SC, Thompson JY, Swift Jr EJ, Stamatiades P, Wilkerson M. A characterization of first-generation flowable composites. J Am Dent Assoc 1998;129:567-77. 6. Alvarez-Gayosso C, Barcelσ-Santana F, Guerrero-Ibarra J, Sαez-Espνnola G, Canseco-Martνnez MA. Calculation of contraction rates due to shrinkage in light-cured composites. Dent Mater 2004;20:228-3. 7. Ciucchi B, Bouillaguet S, Holz J. Proximal adaptation and marginal seal of posterior composite resin restorations placed with direct and indirect techniques. Quintessence Int 1990;21:663-9. 10. Neiva IF, de Andrada MAC, Baratieri LN, Monteiro Jϊnior S, Ritter AV. An invitro study of the effect of restorative technique on marginal leakage in posterior composites. Oper Dent 1998;23:282-9. 11. Bowen RL, Eichmiller FC, Marjenhoff WA. Gazing into the future of esthetic restorative materials. J Am Dent Assoc 1992;123:33-99. 15. Bullard RH, Leinfelder KF, Russel CM. Effect of coefficient of thermal expansion on microleakage. J Am Dent Assoc 1988;116:871-4. 16. Momoi H, Iwase H, Nakano Y, Kohno A, Asanuma A, Yanagisawa K. Gradual increase in marginal leakage of resin composite restorations with thermal stress. J Dent Res 1990;69:1659-63. 17. Eick JD, Cobb CM, Chappel P, Spencer P, Robinson SJ. The dentinal structure: Its influence on dentinal adhesion. Part I. Quintessence Int 1991;22:967-77. 19. Longfellow HW. Resin polymerization. In: Albers HF, Tooth colored restoratives, Principles and Practices. Hamilton: Bc Decker Inc.; 2002. p. 97. 20. Peris AR, Duarte S, de Andrade MF. Evaluation of marginal microleakage in class II cavities: Effect of microhybrid, flowable, and compactable resins. Quintessence Int 2003;34:93-7. 30. Bayne SC, Thompson JY, Swift Jr EJ, Stamatiades P, Wilkerson M. A characterization of first-generation flowable composites. J Am Dent Assoc 1998;129:567-77. 31. Chuang SF, Liu JK, Chao CC, Liao FP, Huey Y, Chen M. Effects of flowable composite lining and operator experience on microleakage and internal voids in class II composite restorations. J Prosthet Dent 2001;85:177-81.